Every time I hear that nursery rhyme I need to say the WHOLE thing in my head! Anyone else? LOL! 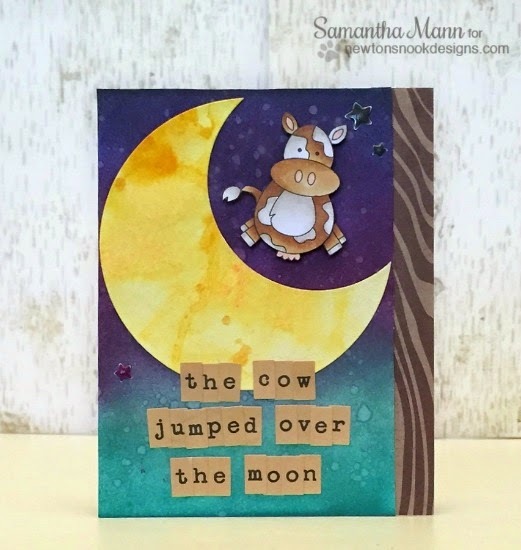 This card by Samantha Mann today features part of that rhyme along with a a super cool moon and of course, our cute new cow stamp, jumping over it! This cute little cow is from our new farm animals set, Farmyard Friends! Samantha cut his feet out and spread them apart a bit to make it look even more like he's jumping - super fun!! Fabulous card! Very eye-catching! Love the background and the moon!